Our industry is at a crucial juncture. Regulation has driven most of today’s disclosure requirements, but to meet the needs of today’s investor, we need to do more. That’s why we’re leading the full transparency movement across Australia and beyond - ensuring your clients are never in the dark with how you're helping them achieve their financial goals and, in turn, helping the industry regain the trust it deserves. By being transparent the industry communicates there’s nothing hidden – what you see is what you get. It’s key to rebuilding trust with the community, and helps drive deeper conversations with investors about their goals and values. When investors are empowered through education and transparency, everyone wins! Until recently, most Australian funds were only disclosing their top 10 holdings. However, today's investor is increasingly wanting control and clarity around how their money is being invested – evidenced by the significant growth of transparent vehicles like ETFs, SMSFs and Managed Accounts, to name a few. That’s why we’re leading the movement for all Australian funds to do the same – ensuring they better meet the transparency needs of investors and enabling them to build better strategies for all Australians. View Australia’s transparent-fund leaders, who have joined our movement for full portfolio holdings disclosure. 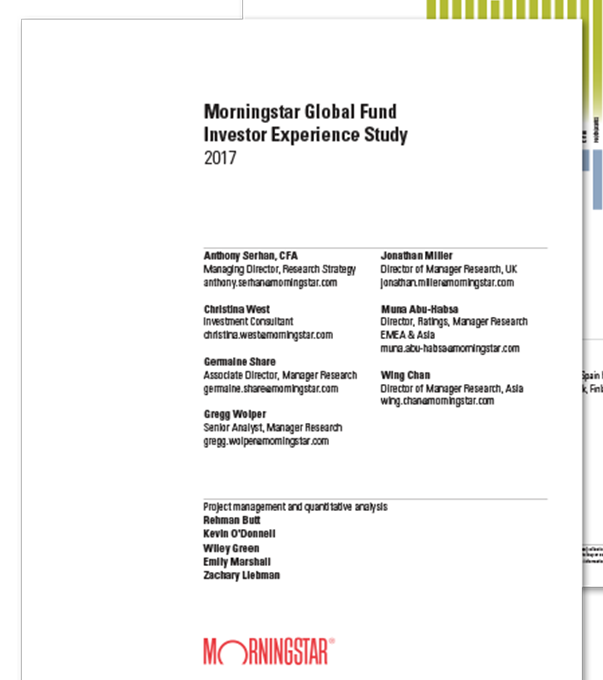 At Morningstar, we believe that while many factors can explain superior investor outcomes, only one has been shown to make a consistent difference – cost. That’s why we’re supporting the movement towards greater transparency around fees and costs in Australia, allowing for more accurate benchmarking and product comparisons – and ensuring that as an industry we continue to maximise the return on clients’ investments. Access a fees and costs benchmark report, powered by RG97 data available through Morningstar Direct and Morningstar Data Feeds. Today’s investors increasingly want to invest in ways that lead to both good returns and good practices. With full transparency of portfolio holdings and our unique sustainability ratings, you can better align yourself to the needs of these investors by revealing how well the companies in their portfolios are managing key environmental, social and governance factors. Download our latest Global Fund Investor Experience report to learn how Australian funds stack up globally. 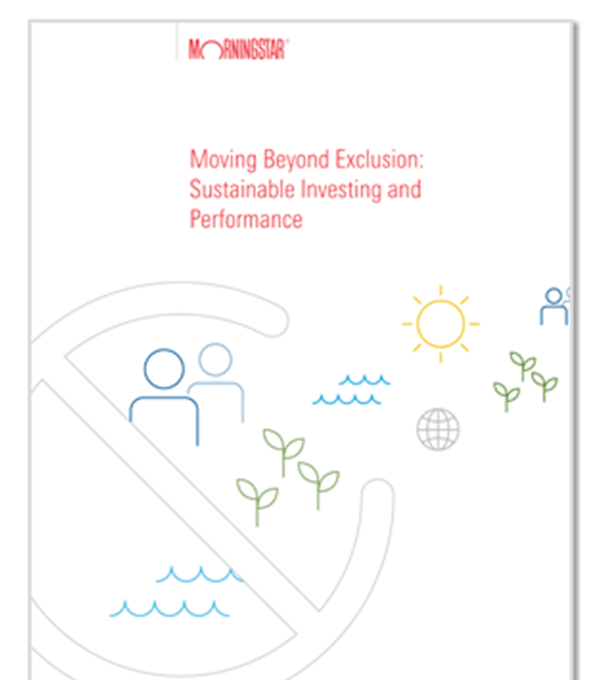 Download our guide on how to better serve sustainability-minded investors. 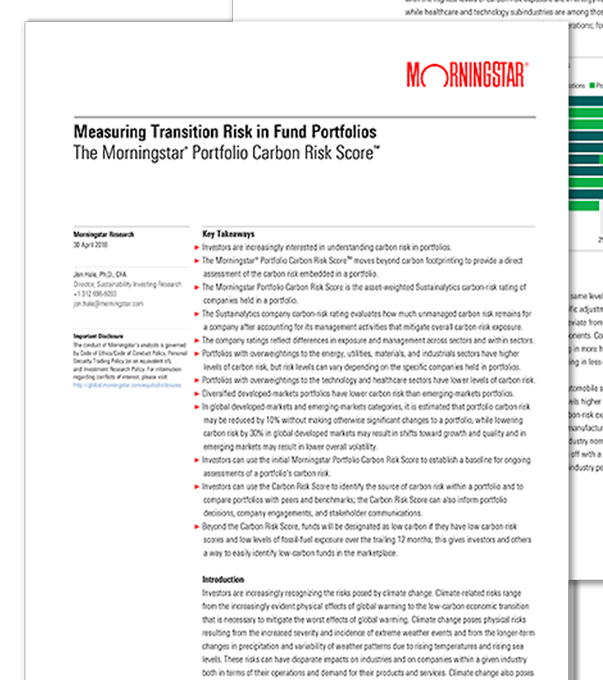 Download our whitepaper to help you measure carbon-risk profiles of more than 30,000 funds globally. Join the growing number of Australian fund managers and intermediaries who've joined our movement by disclosing full portfolio holdings and insisting on nothing less than full transparency. Disclaimer: © 2018 Morningstar, Inc. All rights reserved. Neither Morningstar, its affiliates, nor the content providers guarantee the data or content contained herein to be accurate, complete or timely nor will they have any liability for its use or distribution. Any general advice or ‘class service’ have been prepared by Morningstar Australasia Pty Ltd (ABN: 95 090 665 544, AFSL: 240892) and/or Morningstar Research Ltd, subsidiaries of Morningstar, Inc, without reference to your objectives, financial situation or needs. Refer to our Financial Services Guide (FSG) for more information. You should consider the advice in light of these matters and if applicable, the relevant Product Disclosure Statement before making any decision to invest. Our publications, ratings and products should be viewed as an additional investment resource, not as your sole source of information. Past performance does not necessarily indicate a financial product’s future performance. To obtain advice tailored to your situation, contact a professional financial adviser. Some material is copyright and published under licence from ASX Operations Pty Ltd ACN 004 523 782.